20 VISSCHER, N. Nova Totius Terrarum Orbis Geographica. ( Amsterdam, 1652) Col. ancien. Carte doubl�e de papier fort pr�sentant des manques, papier fortement bruni, d�chirure verticale sur toute la longueur et petites d�chirures restaur�es, coloris affadi. Cadre. En l'�tat. - Laid down on paper, restored tear along center fold, several marginal tears running into the borders, on eight places inside the map, small pieces missing. Orig. colours a bit faded. Framed. Sold as is. 450 x 555 mm. � Splendide mappemonde � bordures en projection de Mercator. Visscher reprend le mod�le cartographique de Blaeu mais corrige et amende la carte pour y faire appara�tre de nouvelles d�couvertes dans la baie d'Hudson. Richement orn�e, les bordures sup�rieure et inf�rieure repr�sentent 12 empereurs romains, alors que les bordures lat�rales repr�sentent des vues de villes et des personnages en costume indig�ne. Dans les angles, 4 m�daillons figurent les all�gories des 4 continents. 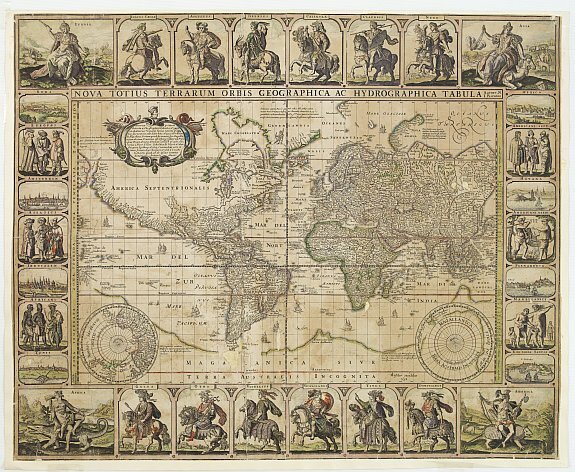 - This stunning "carte-a-figures" world map on Mercator's projection is one of the most richly decorated maps from the Dutch period of pre-eminence in cartography. While the cartography is similar to Blaeu, Visscher's map has been updated to show the discoveries around Hudson Bay and shows the St. Lawrence River extending to a small lake in the middle of North America. Two polar insets fill the bottom corners and a cartouche in the interior of North America tells of the discovery of America by Columbus, but erroneously dates the voyage to 1592. The magnificent panels surrounding the map include twelve Roman emperors on richly caparisoned horses at the top and bottom, and six groups of national figures and six vignettes of principal cities at the sides. The corners are filled with female allegorical representations of the continents: Europe in a pastoral setting, Asia seated on a camel, America as a warrior queen riding an armadillo, and Africa reclining on a crocodile. 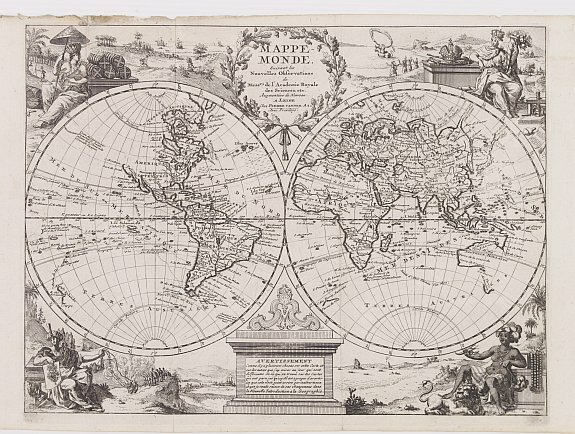 The map originated in 1639, this being the 1652 issue with Visscher's name and date near the inset of the South Pole. - Shirley, World, 350. 22 L'ISLE, G. de. H�misph�re M�ridional pour voir plus distinctement les Terres Australes.. ( Paris, 1714) Limites en col. ancien. Belle impression sur papier fort. 460 x 460 mm. � De l'Isle approach was much more scientific than that of his predecessors, and any area about which he did not have enough information was simply left blank. He removed the great southern continent, only including a small island supposed to have been seen by Sir Francis Drake. His outline of Australia is taken from that of Tasman and he does however add Dampier's discovery of Sharks Bay (1700) and inserts his track. 23 AA, P. van der. Mappe-Monde. ( Leyde, 1720) Traces de pliures, marge sup. salie, 2 infimes trous de ver dans la partie sup. - 2 minor wormholes in upper part. 222 x 300 mm. � Carte d�corative orn�e de vignettes symbolisant les 4 continents. - Decorative world map in two hemispheres. Vignettes symbolising the four continents occupy the corners; between the hemispheres there are two elaborate cartouches. 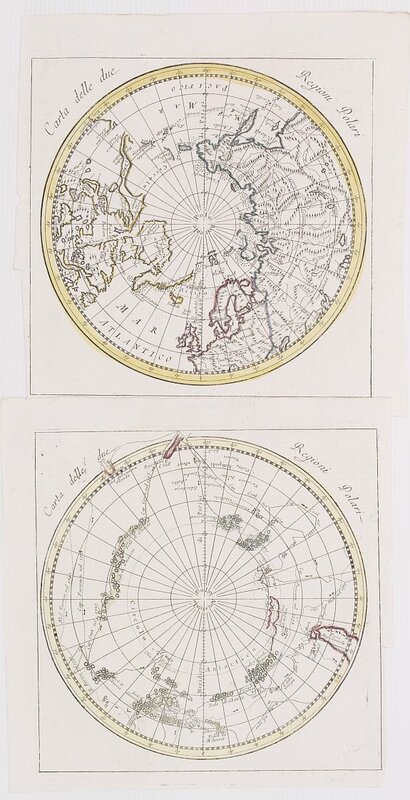 24 GODSON, W. / WILLDEY, G. A new and correct map of the world Laid down according to the Newest Observations & Discoveries .. Apearances of planets &c. ( Londres, G. Willdey, ca. 1715-1732) Limites en col. ancien. Carte en 2 ff. non jointes. Marge inf. coup�e au filet d'encadrement, fente restaur�e en haut et bas sur 4 cm � l'int. de la carte, fentes le long des pliures verticales. Belle impression. - 2 sheets to be joined together. Lower margin cut till neat line, repair of a tear in lower and upper part of map, running 4 cm into engraved area, vertical folds separating. A good and dark impression. 640 x 963 mm. 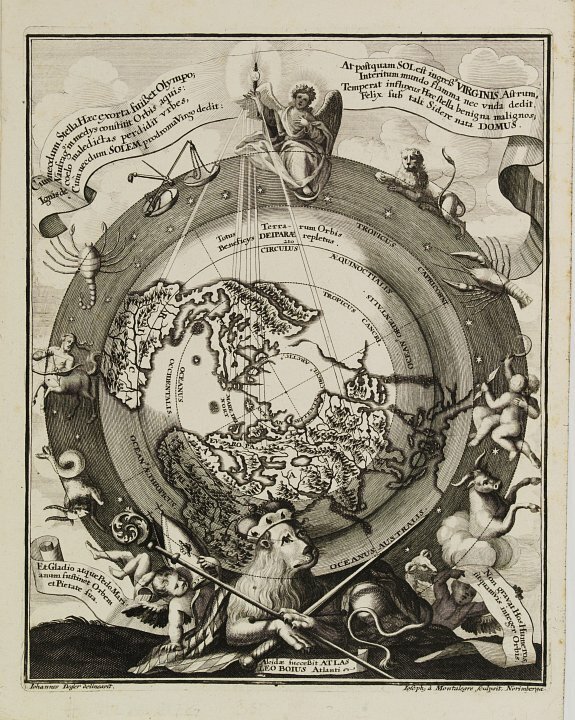 � Grande mappemonde grav�e par W. Godson, publi�e par G. Willdey. Elle est orn�e d'h�misph�res c�lestes et de projections au p�le. La Californie est repr�sent�e en tant qu'�le. 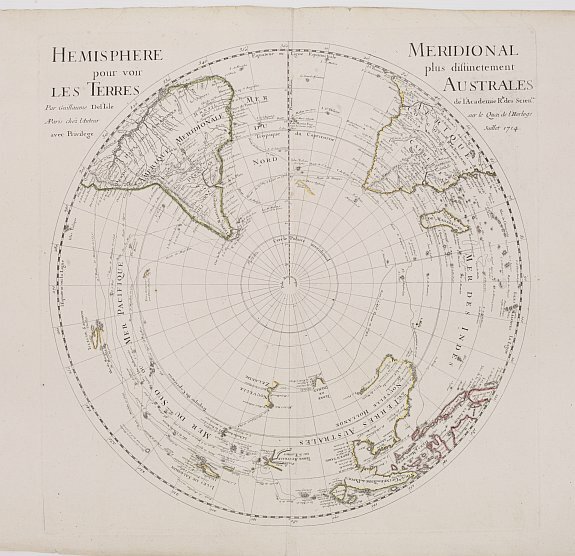 De plus cette carte indique les courants maritimes et les variations magn�tiques d'apr�s les th�ories de Halley. - Large scale, robustly engraved English double hemisphere map of the world by W.Godson. California as an island. Beside the cartographic content, the map has a wealth of descriptive text within the spheres. Among the interesting features are Halley's theories of water currents and magnetic variations, boldly engraved within the spheres. In upper and lower part celestial hemispheres and around the spheres are various maps of the world on different projections. Published by George Willdey. Willdey seems to have been a wheeler-dealer, whose shop was stocked with all manner of goods and commodities, many of which are listed and illustrated on some of his maps, including spectacles, scientific instruments, cutlery, toys, snuff, and so on. The map side of his business seems not to have been very successful, and few examples of the atlas or single sheet maps survive today. 25 BELLIN, J.N. 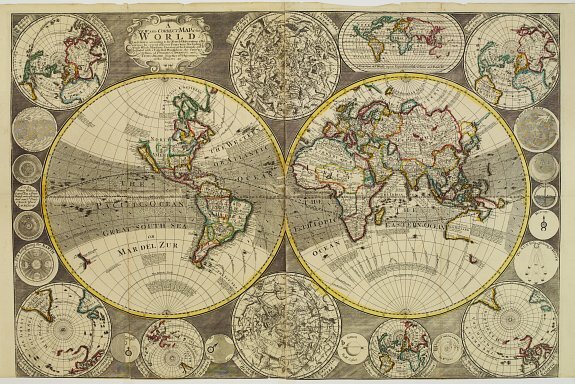 Essay d'une Carte r�duite� du Globe Terrestre� ( Paris, 1748) Rousseurs et taches brunes. - Brown spotting, paper age-toned. 500 x 694 mm. Detailed and finely engraved large scale map of the world in Mercator's projection. Van Diemen's Land still joined to New Holland. The North West coast of America rather crudely shown. 26 L'ISLE, G. de. / BUACHE, P./ DEZAUCHE, J.A. Mappemonde a l'usage de l'instr.on. Par Guillaume Delisle et Philippe Buache. ( Paris, Dezauche, 1798) Limites en col. ancien. Papier bruni, importantes mouillures, d�chirure sur 6 cm en haut, � droite du pli central. - Large waterstains, paper slightly age-toned, 1 tear in upper part (6 cm into engraved area). Orig. outline col. 450 x 660 mm. � Version revue et corrig�e de la mappemonde de Buache de 1785, "Revue et Augment�e des Nles D�couvertes en 1798". 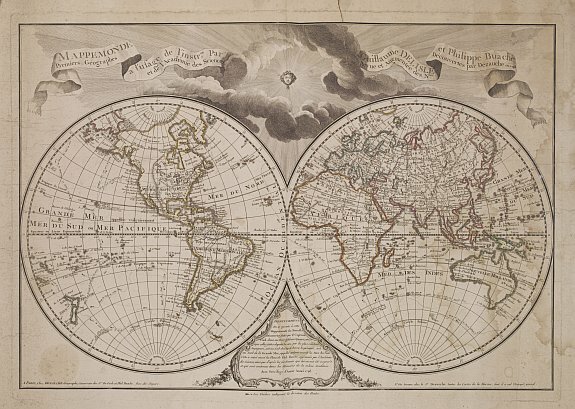 - An updated version of the double hemisphere world map by Buache of 1785. The original dedication to the King is removed, as the map was printed after the French Revolution. Decorative world map with curious delineation of Alaska. Showing the tracks of Capt. Cook. Van Diemen's Land connected to mainland Australia. The complete title is divided over two garlands : Mappemonde a l'usage l'instr.on par Guillaume Delisle et Philippe Buache Premiers G�ographes et de l'Acad'emie des Sciences. Revue et augment�e des N les D�couvertes par Dezauche en 1798. Philippe Buache was one of the most active proponents of the so-called school of theoretical cartography active in mid-18th century France. 29 DOPPELMAYER, J.G. / HOMANN, J.B. Tabula selenographica.. Hevelii quam Riccioli. ( Nuremberg, 1730) Beau col. ancien. Petite d�chirure restaur�e en bas du texte sur 2 cm, petit trou de ver en haut du texte. 484 x 580 mm. � Carte de la lune en 2 h�misph�res, publi�e dans lAtlas Coelestis de Doppelmayer, avec indications des noms de mers et de crat�res. - The moon map has been published in the J.G.Doppelmayer Atlas Coelestis. 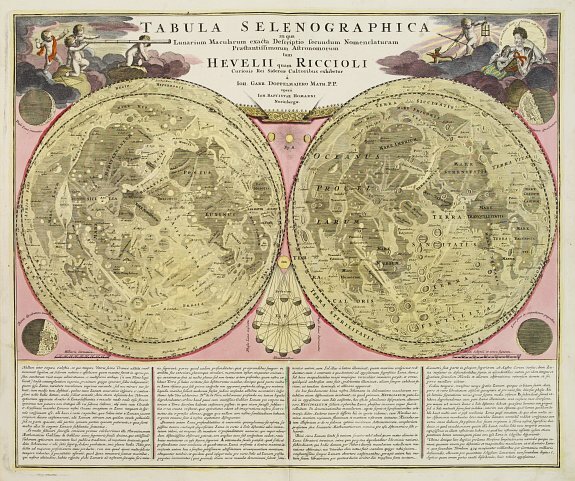 It shows two representations of the surface of the Moon, with names of seas and craters introduced by Riccioli (left) and Hevelius (right) respectively mythological figures in the upper corners. 30 JEAN. La Sph�re Artificielle. ( Paris, 1805) Belle impression sur papier fort, infimes rousseurs. 458 x 692 mm. � Superbe sph�re armillaire entour�e des diff�rents syst�mes : Copernic, Ticho Brahe, Ptol�m�e et Descartes. 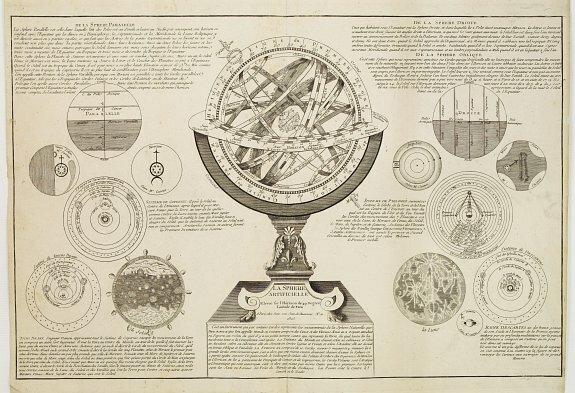 - Armillary sphere with surrounding astronomical diagrams. Fine condition. 31 ZATTA Carta delle due Regioni Polari. (P�les Nord et Sud). ( Venise, 1782) Limites en col. ancien. 2 cartes en parfait �tat. 225 x 225 mm. � Repr�sentation des p�les bor�al et austral. 32 SCHERER, H. Cumnecdum Stella Haec extorts suiset Olympo .. (P�le arctique). ( Munich, 1703) Belle impression. - Good and dark impression. 245 x 198 mm. � Carte du p�le Nord entour�e des 12 signes du zodiaque. - Northern Celestial Sky, with a projection of the Northern Hemisphere in the interior. The terrestrial projection shows California as an Island and a potential NW Passage and also a possible continuous landmass to Asia. The Celestial projection shows three dimensional representations of the constellations. The map rests on the back of a lion, wearing a crown. From the "Atlas Novus" by P. Heinrich Scherer, S.J. Designed by Johannes Degler and expertly etched by Joseph � Montaglegre of Nuremberg. Scherer (1628 - 1704), a professor of mathematics and a cartographer in Munich published this beautiful atlas in 1703.